I was just 2 1/2 months old when a shameful (for humanity) event of the 20th century happened: John Ono Lennon was killed outside the Dakota Building by the fool Mark David Chapman, in New York City. This act of evilness, apparently and unfortunately banal if we think that every day men kill other men around the world with no remorse, would become symbolic, because of Lennon's charisma, of the tension lived between two separate and predominant forces: love and hate, constructive feelings versus destruction, war against peace. Destruction never serves progress, never brings happiness, never fights for equality, balance and justice. More than the symbolic newspaper-selling man, the dreams of a creative and much loving couple were cut in two, ripped and brutally destroyed, and two kids lost their father. It was like a robbery - of happiness and joy. Only the ones who found the love of their lives can imagine how unbearable such loss must have been. Fortunately, Yoko Ono was, IS and WILL BE well alive, creative, active and happy - for world's sake. 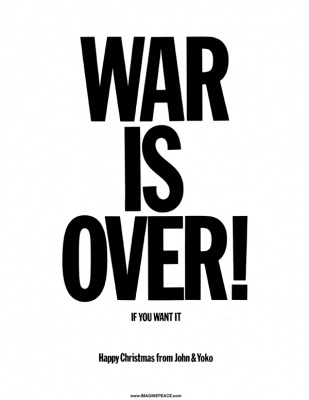 And so after 2004 Onochord, two CD's released this year and the wonderful Imagine Peace Tower illuminated in Iceland last October, she's urging everyone to download and print 1969's Yoko & John "War is Over! If you want It" message and Christmas wishes this season! People can print it and put it on windows, cars, streets, workplaces, banners... anywhere they want. Yoko is wittily using her fame in positive ways once again, and asking Lennon's old fans to act as well. Join this peace wave and do your own share for world's brotherhood and joy. Indded, "I swear it is not too late..." Kant universalized it by calling it "perpetual peace" but that conjures up to my mind the peace of the cemetery where nobody quarrels and everybody is at peace. It seems to me that in the spirit of thise season, real peace is not quietism and more often than not implies a great struggle against evil and injustice which is far from "peaceful". There are daily revelations of frightful deeds by both participants in current violent conflicts. Evil and injustice is quite obvious to each side as it looks at the other. Facts are facts. Evil acts are evil anywhere. Love ones too. That's the good news! I must say whenever anyone asked me if I believed in God, I always answered, since I remember: "I don't believe in God, I believe in Love". And this explains, in part, why. We are responsible. Indeed that is the good news Ms. Pereira: that God is love as Dante finds out at the end of interiour journey, and that ultimately love will conquer evil. Those cynics and rationalists who don't believe it are in darkness even if they mislabel themselves "enlightened" persons. P.S. Another observation may be appropriate and worth reflecting upon here. In the sixties there were in America several hyppies' communes based on ideals such as love and peace. The philosophy seemed to be: love and do what you wish. Some even went back to St. Agustine to find it. There was a subsequent study done of them. None had survived except those who were underpinned by some sort of discipline demanded for the common good and some sort of religion, albeit a New Age one. Moreover, at least one of those communes went terribly astray, that of Charles Manson. Who could fail to love a God that permitted the holocaust to occur or did not deter the instant death of many thousands of innocents at Hiroshima or erected an extremely nasty place supervised by demons to eternally torture people who might have made a mistake by believing in some other god. Love has strange ways to exhibit itself. restrained from them, which they have imagined to do. they may not understand one another's speech. all the earth: and they left off to build the city. LORD scatter them abroad upon the face of all the earth. I seeeeeeeeee the logic: God made determined robots, he controls everything they do and therefore He and not his robots are responsible for their actions. In that case Nietzsche had it on target: declare God dead and assert your freedom. That kind of misguided logic does not in any way absolve us from our guilt. Which way do we want it gentlemen: if God exists he is responsible for all the evil in the world including the Holocaust. If God does not exist then you are barking up the wrong tree. Is this the universal cake that one can eat and keep at the same time till it is defecated into a latrine? When we say we are after “the whole story of the whole cosmos for the whole person,” we mean that unless we exercise this profound concern we can never have hope in the quest for our own wholeness. A complete and comprehensive story of the whole for us mortals is impossible, but its very impossibility—which we must never forget—makes hope possible. And if hope, perhaps faith and love. Readers interested in reading the whole article may open the above link. Carl Sagan: You can't convince a believer of anything; for their belief is not based on evidence, it's based on a deep-seated need to believe. To Alexandra Pereira: see the conversation with Linda Lane in the comments under her recent article "Ideas worth Spreading."